How Long Should Content Be For SEO, 300, 500, 1000 Words Or More? Prior to 2012, plenty of poor-quality content ranked at the top of Google searches. These short-form web pages, articles and blog posts generally lacked substance and gained prime position by keyword stuffing. This was incredibly frustrating for anyone trying to conduct detailed research using Google. Google responded to this problem in two ways. Firstly, they introduced a new algorithm, designed to favour in-depth content in search engine results. Secondly, the introduction of Panda Algorithm shook things up by devaluing ‘thin’ content and prioritising complex, high-value content. So, what exactly is ‘thin’ content – and how does it differ from complex content? Does this dichotomy correlate to article length? In other words – are thin articles always short and are complex articles always long? This post will discuss the impact of content length on SEO. Hint: the answer is not as straightforward as you might think! Thin content refers to low-value, sparse writing that lacks detail or insight. It can also refer to content that has been copied or re-hashed from other sources. On the face of it, short web pages or articles under 300 words seem a ripe breeding ground for the kind of ‘thin’ content Google now dislikes. Industry general consensus in 2018 indicates that web pages, blogs and articles should generally (though not always) be at least 300 – 500 words for the purposes of good SEO. Recent studies have shown long-form content tends to rank higher on search engine results. A well-known study by SerpIQ from 2012 found that the highest-ranking content averaged 2032 words. More recently, SEMrush found a 45% difference in content length between the top 3 pages and the page ranked in twentieth place. The top three pages featured longer content of at least 750 words. In addition, Buffer found the optimal length for a blog post to be 1600 words. Furthermore, long-form content may boost SEO indirectly. This is because long-form content is much more likely to be shared or liked. Also, it’s more likely to contain quality backlinks, which can reduce bounce rate. In turn, this is likely to encourage conversions. In light of the above, it’s unsurprising that contemporary SEO marketing strategies often recommend regular, lengthy web articles and blog posts (above 1200 words) to boost SEO. So, will this strategy always work? 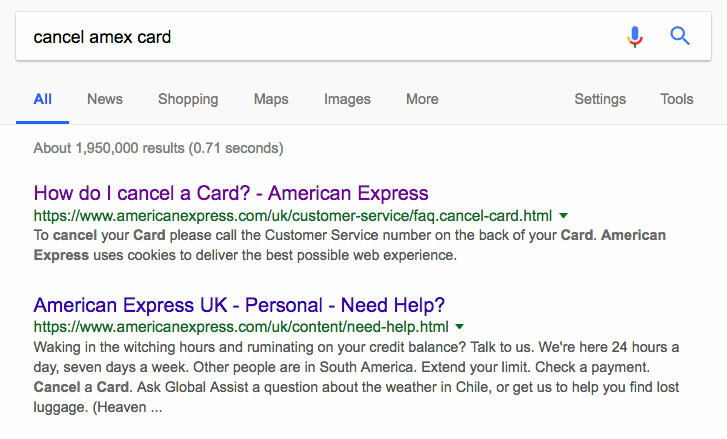 If you type the words “cancel Amex card” into Google, the most relevant and useful webpage appears at the top of the rankings. From what you’ve heard so far, you might expect the first page to be long-form, or at least contain the industry-recommended 300 words! Given this webpage has only 27 words – there are clearly other important aspects to Google’s search algorithm besides the length of content. Though concise, the content on this page is not ‘thin.’ It’s informative, original and driven towards meeting the users’ needs. And the virtually empty page is highly relevant so Google determines the site from Amex itself is the most relevant to the question. The page borrows authority from the rest of the site so to speak. Common marketing strategies suggest that posting regular, long-form content can boost online visibility. As such, you’ll find many companies posting daily content (of varying quality) on their blogs to try and increase traffic to their website and boost SEO. To demonstrate a second ‘exception to the rule’, let’s pretend you’d like to search for some grammar assistance on Google. 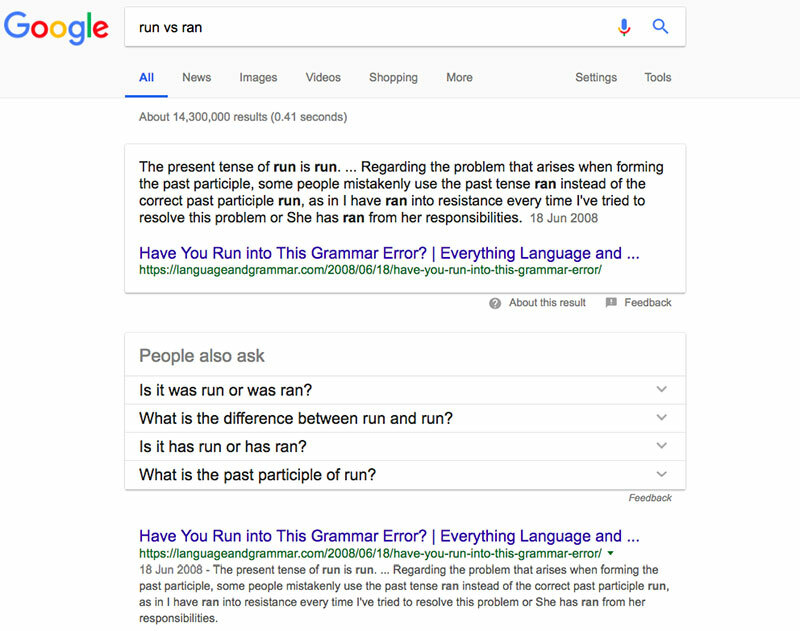 Typing in the query “run vs ran” returns a webpage with some very informative guidance on this common grammatical error. If you look closely, you’ll see the top-ranking webpage was created in 2008, and the blog is not posting content regularly. In the war of the ranks – it seems regular blog posting is not as crucial as we’re often led to believe. Rather, focusing on creating high-quality, valuable content that retains interest overtime is likely to be more important. Marketing specialists refer to this kind of content as evergreen content, because, 10 years later – the blog post hasn’t lost any of its function or appeal! It’s also worth mentioning, this post contains a modest 187 words! Although the content is short – it’s not ‘thin.’ It’s informative, unique and highly engaging. These two examples are by no means unique. They serve as a reminder of the complexity involved in Google’s algorithms; when it comes to content length and SEO – there are no black and white rules. However, complexity need not lead to utter confusion. We’ll finish by suggesting ways in which the information in this article can be used to guide content creation. Whilst there does seem to be evidence to suggest that long-form content boosts SEO, it is not going to be appropriate for all types of content. Furthermore, many short-form pages have successfully climbed the rankings. This suggests you’d do well to use a combination of short and long-form content to create an effective marketing strategy. Jason notes that, whilst long-form content is generally suitable for informative blog posts, short-form content is a lot more acceptable for website landing pages – as these tend to provide simple outlines of a business’ services. The studies and examples cited in this article show that, regardless of length, it’s important to create content that is rich, high-quality and informative if you want it to rank highly in search engines. Given that ‘quality’ is important to rankings, you should think about the purpose of your content when determining its optimum length. High-quality content is fit-for-purpose and appropriate for the type of information being shared. 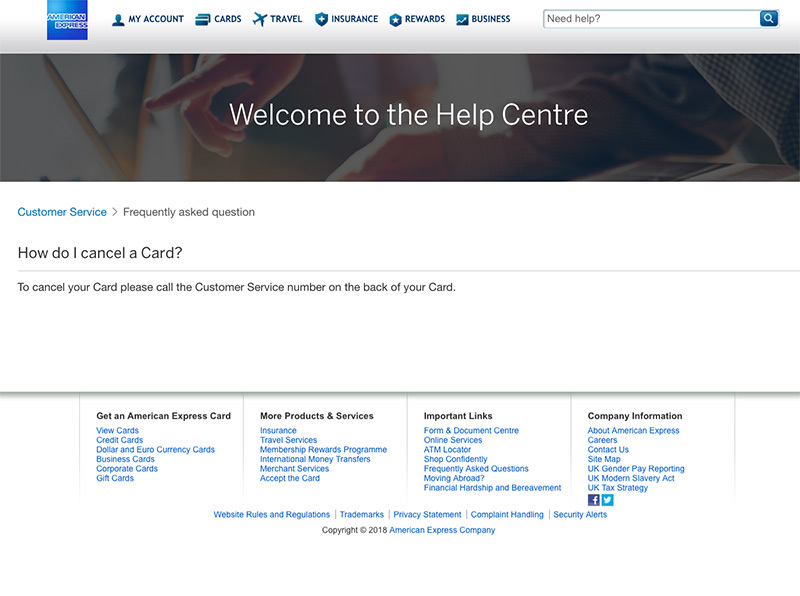 For example, AMEX presented their information in a few simple sentences. This short content was fit-for-purpose because it offered instructional guidance to customers looking for a fast, objective answer. However, let’s say you own a gym business and want to offer some free and insightful evergreen content to clients regarding sports nutrition. 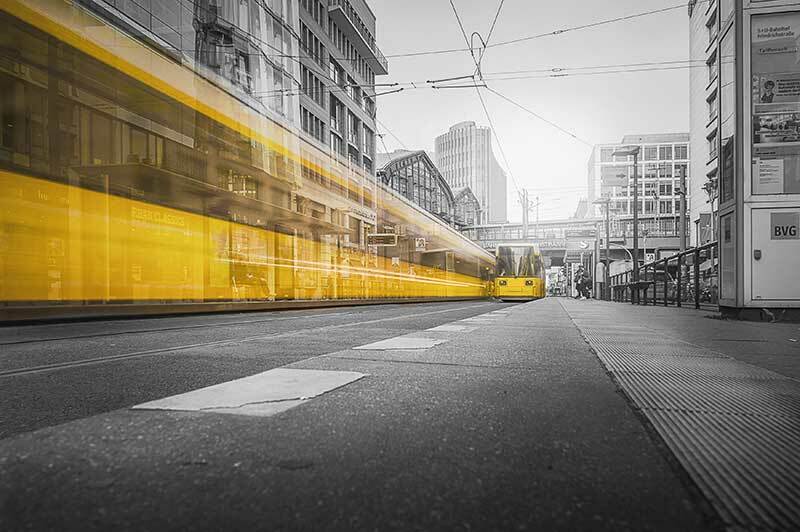 It’s likely that long-form content will be the best option because it will allow space to cover all the key points – thereby offering visitors a meaningful and engaging experience. creating compelling and useful content will likely influence your website more than any other factors. So, when you’re considering whether to use 300, 1000 or 2000 words, be sure to consider the purpose of your content – and make quality your top priority!